You're nearing retirement. Once you hit this milestone, you won't have any reason to worry about your credit score, right? Not exactly. Maybe you expect to have your auto loan and mortgage paid off by the time you hit retirement. Maybe you don't even expect to apply for any new credit cards once you leave the working world. But what you plan is often far different from what actually happens. What if you haven't paid off your mortgage by retirement and you want to refinance your existing loan to one with a lower mortgage payment? You'll need a good credit score. What if your car breaks down and you need to buy a new one? If you want to finance the purchase of a new car, you'll need a solid credit score to qualify for an auto loan. There's good news here, though: Keeping your credit score high during your retirement years doesn't have to be difficult. You just need to remain diligent about paying your bills on time and using your credit wisely. Here are some ways you can do that. You might decide after retirement to live an all-cash lifestyle. This makes a certain amount of sense: You're on a fixed income, and you certainly don't want to run up debt on your credit cards. Paying for everything in cash will prevent that from happening. But if you don't use credit, your credit score will start to suffer. You build a strong credit score by using credit wisely. If you don't use it at all, how can you prove you remain a good credit risk after leaving the working world? After retirement, you might not use as many credit cards as you did while working. You might even consider closing those credit card accounts that you no longer use. Resist this urge, though. A good chunk of your credit score depends on how much credit you are using. This is known as your credit utilization ratio. The more of your available credit you are using, the worse it is for your credit score. If you close an open credit card account, even one you no longer use, you will immediately increase your credit utilization ratio. Let's say you have three credit cards, each with a limit of $5,000. That means you have $15,000 in total available credit. Now let's say you owe $3,000 in credit card debt. You have a credit utilization ratio of 20 percent ($3,000 divided by $15,000), which is considered good — lenders typically like to see this number under 30 percent. If you close one of your cards, you will automatically lower your total available credit to $10,000. Now, owing $3,000 out of $10,000 just bumped your credit utilization ratio up to 30 percent, all without you spending a cent. It's natural once you hit retirement to want to help your children or grandchildren financially. But be careful when one of your relatives asks you to co-sign on an auto or mortgage loan. Young adults often have limited credit histories and it can be difficult for them to qualify for financing. They often turn to co-signers — usually a parent — for help. Lenders are more likely to approve their loan requests if someone with a longer, more established credit history is signing up for the loan, too. There's a huge problem with co-signing. If the person you're helping doesn't pay the bill, those late payments go on your credit reports. You are now equally responsible for this new debt. And if your relative defaults on the loan? You'll be the one on the hook. You might not think much about your credit in retirement, but you should still check your three credit reports once every year. 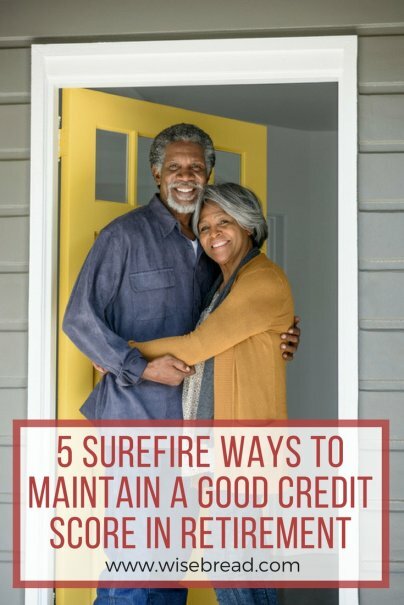 You can do this for free at AnnualCreditReport.com. Make sure to order copies of each of your three credit reports — from Experian, Equifax, and TransUnion — as each might have slightly different information. Check the reports for any mistakes. Maybe a report lists that you missed an auto payment last year and you know you haven't. Correct the mistake by notifying the offending credit bureau. You can do this through email. A mistake on your credit report can cause your credit score to plummet. The last step to keeping your score high during retirement might be the most important: Keep paying your bills on time each month.